It also is to use as a fungicide and helps fight off plant viruses and pathogens. So you may be thinking: sounds too good to be true and what about our beneficial insects, like ladybugs in gardens? 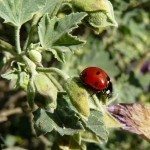 Is Neem Oil Harmful to Ladybugs in the Garden? On the label of any Neem oil product, it boasts Organic and Nontoxic or safe for humans, birds and animals. In the fine print, the label will usually also say nontoxic to plants and beneficial insects like predatory wasps, honeybees, earthworms, spiders, ladybugs, butterflies and other good bugs – also that Neem oil is safe to use on fruits and vegetables. How is it possible that Neem oil seems to differentiate between bad bugs and good bugs? Well, it doesn’t. 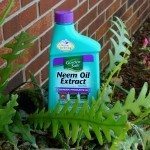 Neem oil can smother any soft body insects on contact, including caterpillars and larvae of some of our beneficial insects. Any oil sprayed directly on any insect can suffocate and smother them. However, Neem oil mainly works by being sprayed on leaves of plants, then the insects that eat these leaves are either repelled by its bitter taste or killed by ingesting the treated leaves. Beneficial insects, like ladybugs in gardens, do not eat the leaves of plants so they are not harmed. Planting eating pests, like mites and aphids, ingest the Neem oil and die. Neem oil is made from the seeds of the Neem tree, native to India. When sprayed on garden plants, it leaves no lasting residue because it washes away with rain and is broken down by ultraviolet rays. Neem oil, when used properly, quickly does its work without leaving long lasting harmful effects on the environment – or our beneficial friends. Concentrated Neem oil should always be mixed with water exactly as the directions say. Too high a concentrate can harm bees. For best results, spray Neem oil in the evening when beneficial insects are least active, but insect pests are still feeding. You can also spray in early morning. Midday, when butterflies, bees and ladybugs are very active, is not a good time to apply Neem oil. 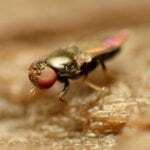 Never spray Neem oil directly on beneficial insects.